Knock, knock....anyone home. Sorry I have not been around lately, it has been crazy with family, work and training...training for the Goofy is tough. It has been an interesting time in my brain lately, lots of smack talk and self doubt and I am working my way through it. When you are overweight, you think once you lose a certain amount of weight and hit into that magical size life would be wonderful and it should be but sometimes it is not. For some reason when I lost my latest bit of weight this summer, I became dissatisfied with my body. Instead of seeing a strong confident women I saw stretch marks, lose skin and a jelly belly; I should have been happy but instead I was miserable. I know it does not sound logical but it is the truth, my truth and I have to work through it. I think that learning to love myself is a process, work in progress and I am not afraid of hard work. I need to love the new me, jelly belly and all because I do not have the spare money for a tummy tuck and bust lift and I really don't want one. A friend challenged us to find a positive body intention for the week, this is mine. I choose to embrace my body, this body is mine, I earned every wrinkle, stretch mark and sag. This body is the vehicle that allows me to do amazing things and as such, I will honor it, without reservations, judgement or disclaimers. A few weeks ago I went to a fitness assessment at the gym I joined. While I did not lie, I was not forthcoming with the consultant since I wanted to see how much of a sales pitch it was. At the end of the hour she had decided I was a middle aged women who was not active and had put on weight recently and needed someone to push her to achieve her goals. She also said I needed to lose 5-8 lbs and a few % of body fat. I think it messed with my head a bit, I wondered if that was what other saw as well. I have decided it does not matter what she thought, I know the truth...now I have to live it. The mental part of weight loss (and gain) is the hardest part. 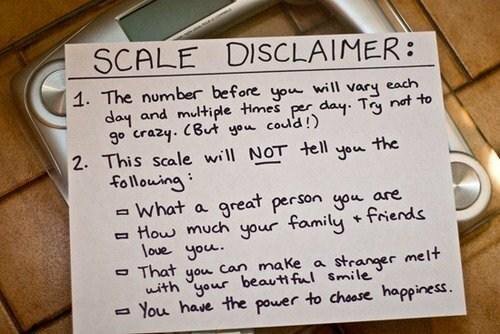 I do weigh myself every day but it will not tell the whole story - you're right!